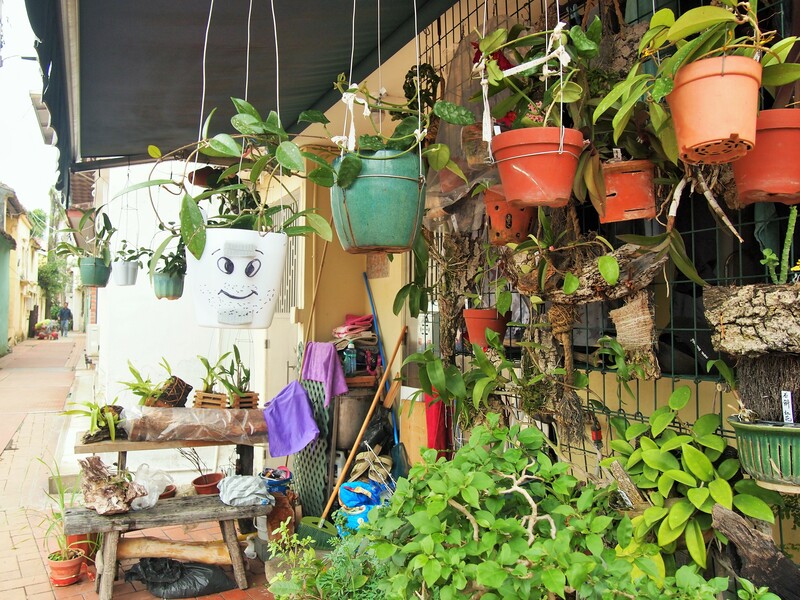 Our day in Coloane started out well enough. 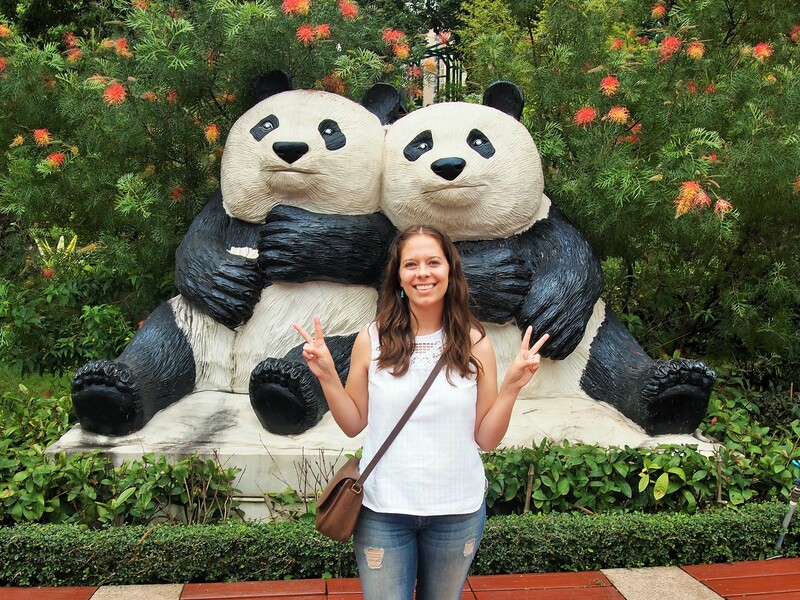 I was ecstatic because our first destination was going to be the Macau Panda Pavilion. 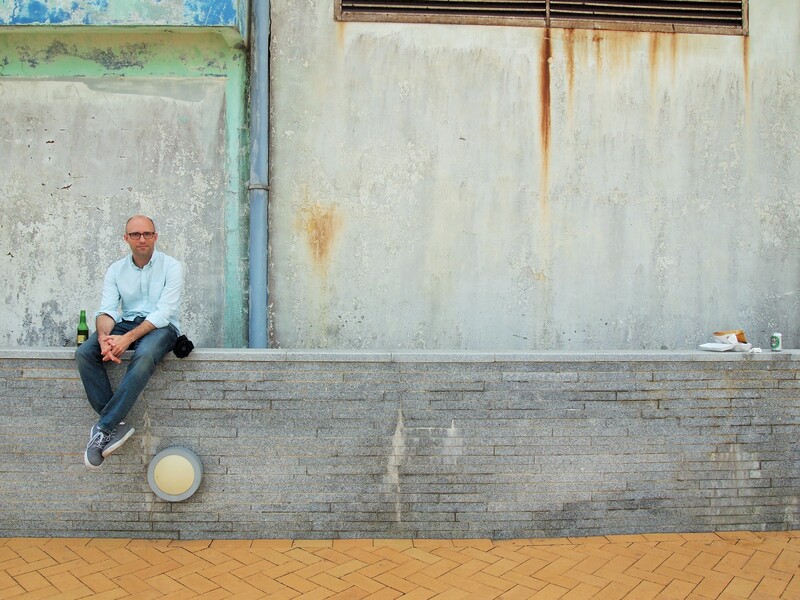 We caught the correct bus from the peninsula but got off a stop too early – my fault. 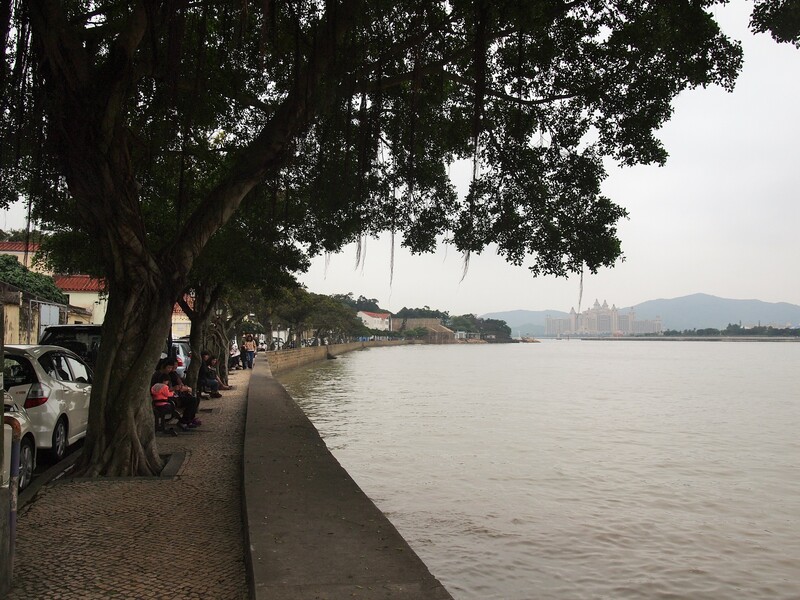 Typically, that wouldn’t have been much of a concern, but Coloane isn’t like Taipa or the peninsula, it’s spread out and we couldn’t figure out where to walk or how far it was. The bus wouldn’t come again for 30 minutes so we decided to hail a cab instead. The problem with that logic is that there weren’t any empty cabs passing by, so we ended up waiting for the bus anyway. 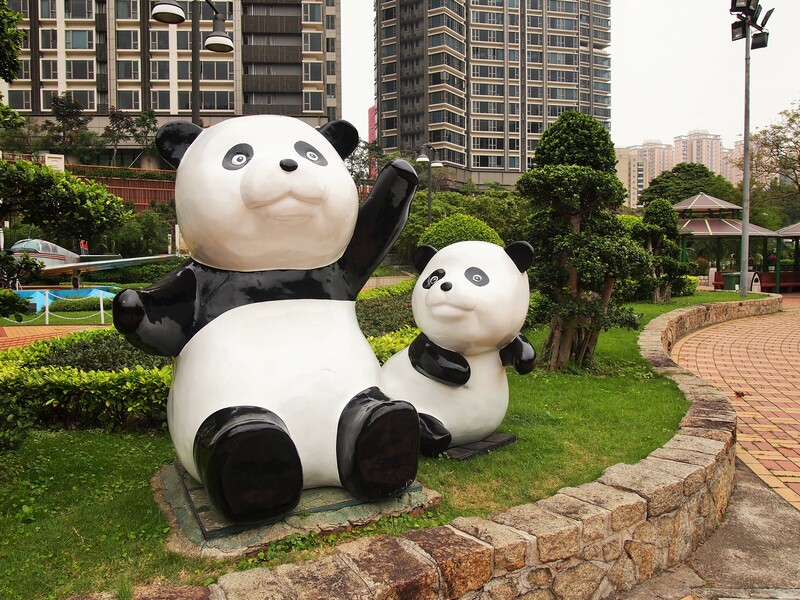 At this point, I remained optimistic – it was just a minor set back in what would become an amazing panda-filled day. 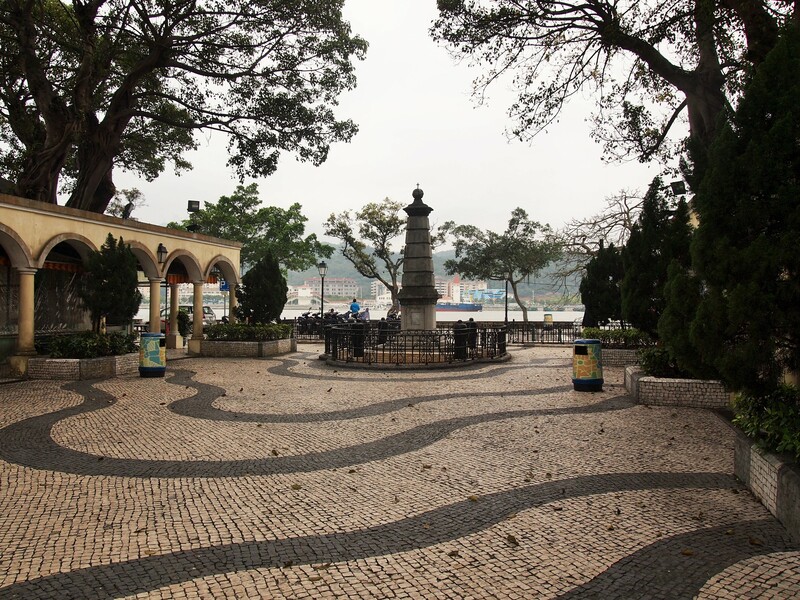 We caught the bus again and went the extra two stops to Parque de Seac Vai Pan. In hindsight, this would have been fine if we had looked behind us, but of course, we didn’t. We were at the beginning of a long drive to the A-Ma Cultural Village, which wasn’t right. Increasingly frustrated, we really did hail a cab this time and continued on to Coloane Village. 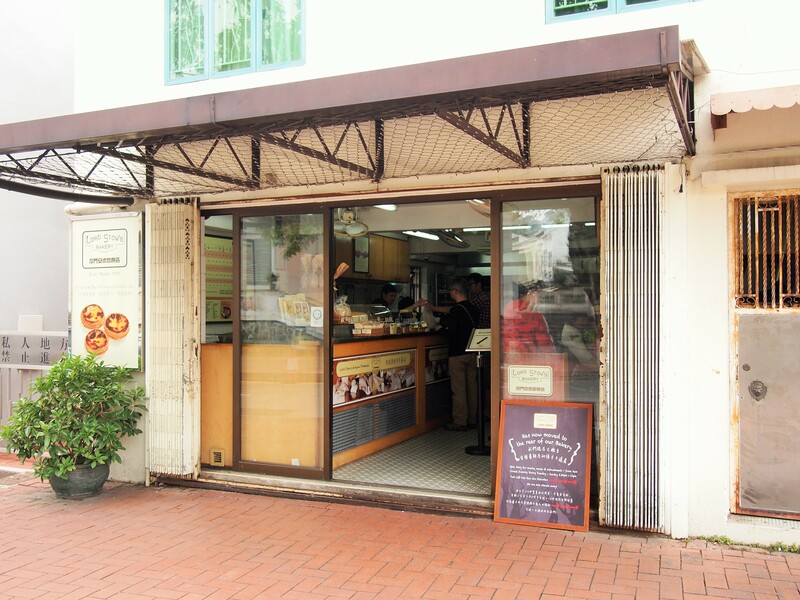 Relieved to be somewhere we intended, Coloane Village was more of a let down than Taipa Village. Tranquil and quaint, it’s much smaller, and there are fewer places to pop in and out to extend your stroll. Still, it’s on the water, and that was a nice treat in itself. Lord Stow’s Bakery is the major draw here. 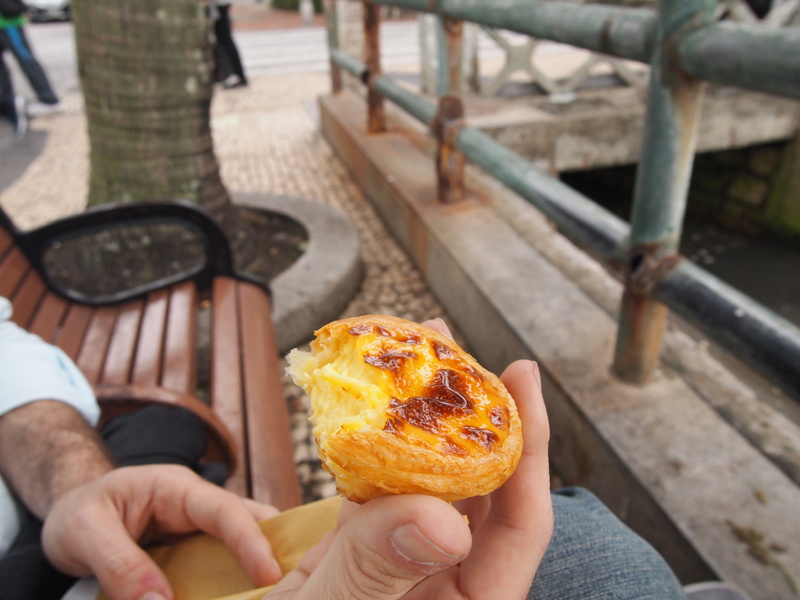 Similar to the pastel de nata we had in Belém, Lord Stow’s egg tart is an English-Portuguese hybrid now famous in Macau. 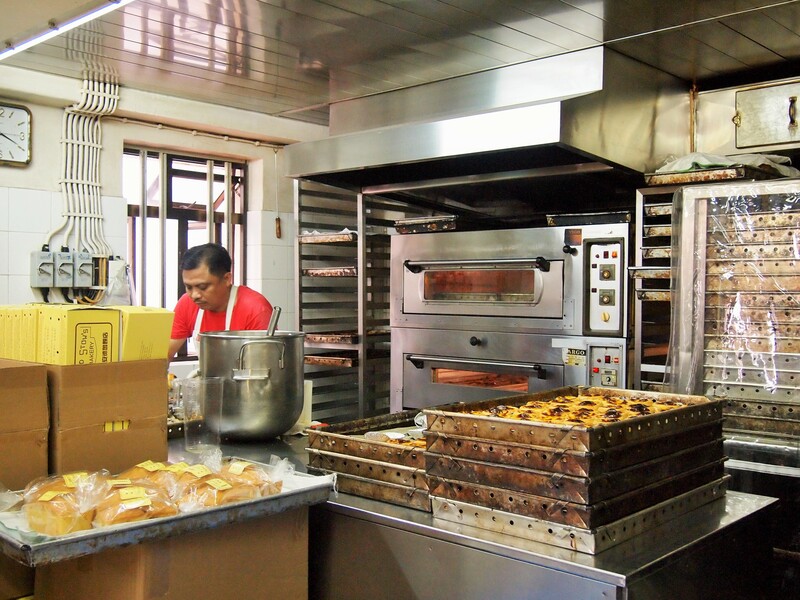 There are satellite stores all over Macau and many other bakeries do their best to make imitations, but the bakery in Coloane Village is the original. After our snack, we set out to walk the village loop. 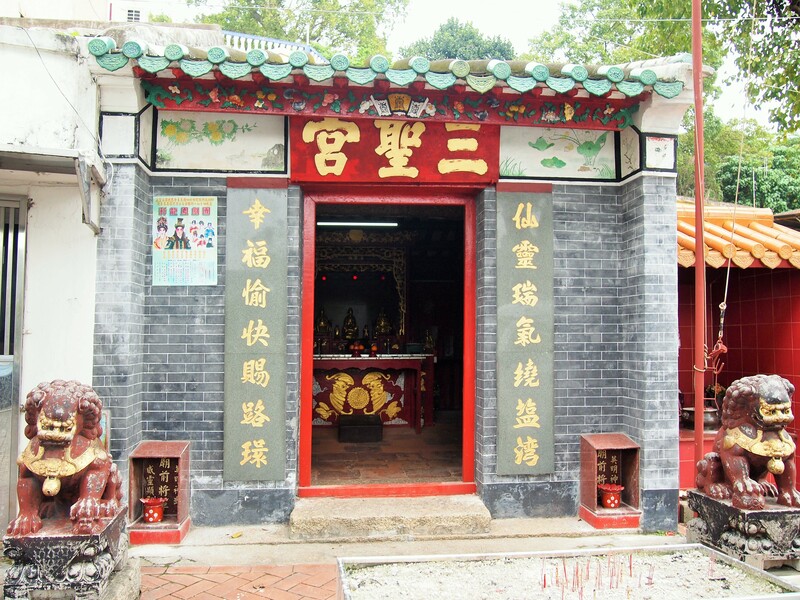 Just behind the several Lord Stow’s Bakery locations, was a row of Chinese homes and Sam Seng Kong Temple, a tiny Buddhist temple. 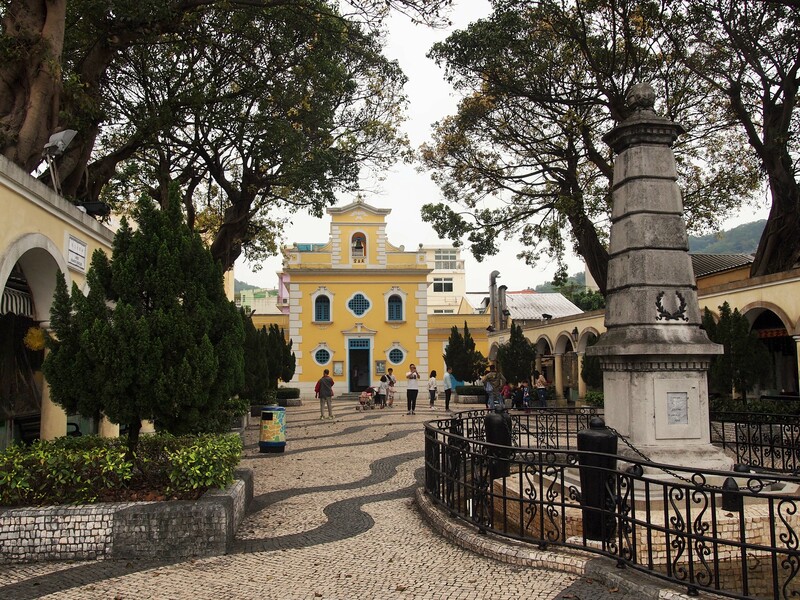 We wound our way back around to the main roundabout and strolled along the seafront to Coloane’s most iconic site, St. Francis Xavier Chapel. 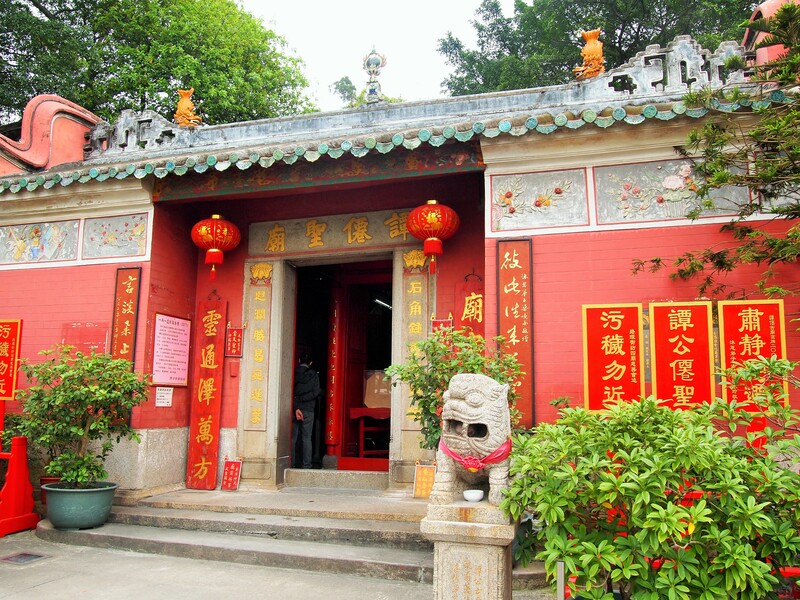 Named for a missionary on his way to China & Japan, it is definitely the most picturesque chapel in all of Macau. 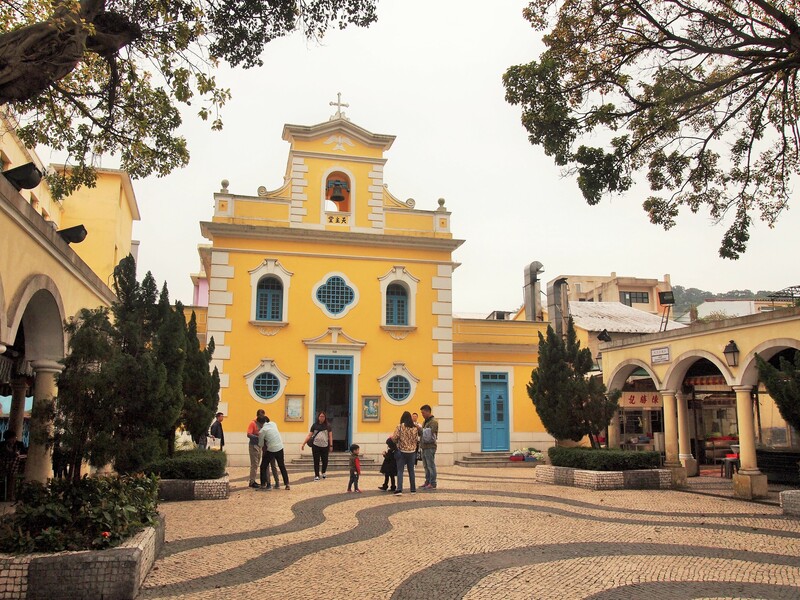 Like most of Macau’s churches, the inside is lacking, but the chapel’s secluded courtyard setting off the main road and its sweet pastel colors make it exceptional. 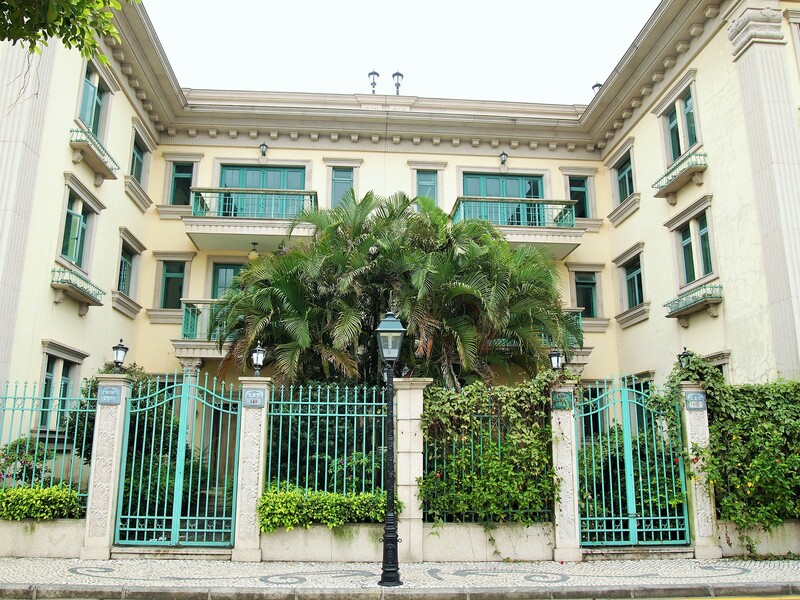 In its hey-day Coloane was a hide out for pirates who used the caves and cliffs off the coast to ransack cargo ships passing between Macau and China. The monument in front of the chapel, complete with cannon balls, commemorates the final pirate attack in 1910. 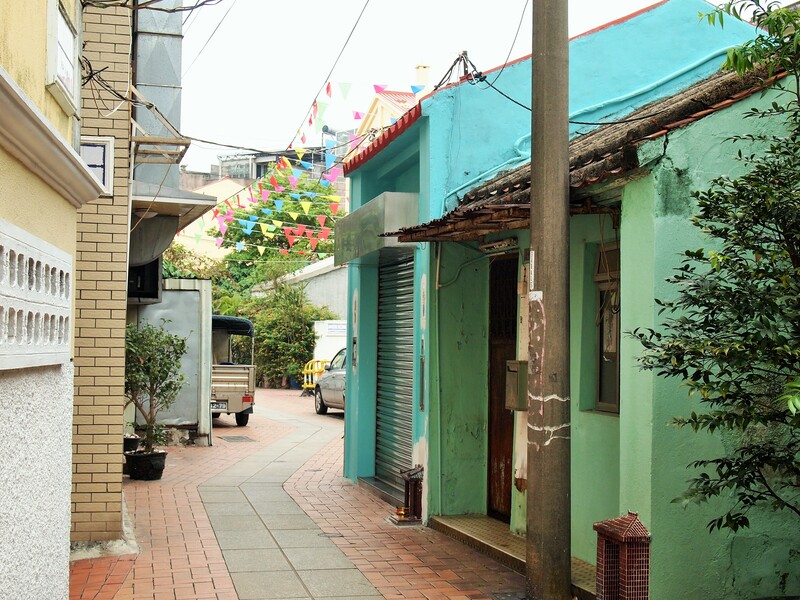 Farther down the lane was Tam Kung Temple. 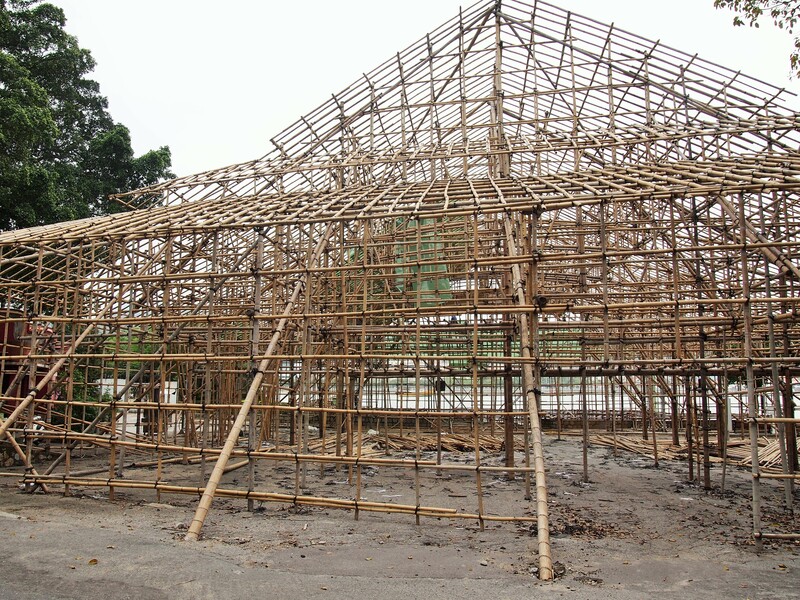 The entrance was impeded by a large bamboo structure – shaped like a giant tent – which appeared to be in preparation for a large event. We had kind of tired of looking at temples at this point so we didn’t poke around and instead, turned to loop back into the heart of the village for some lunch. 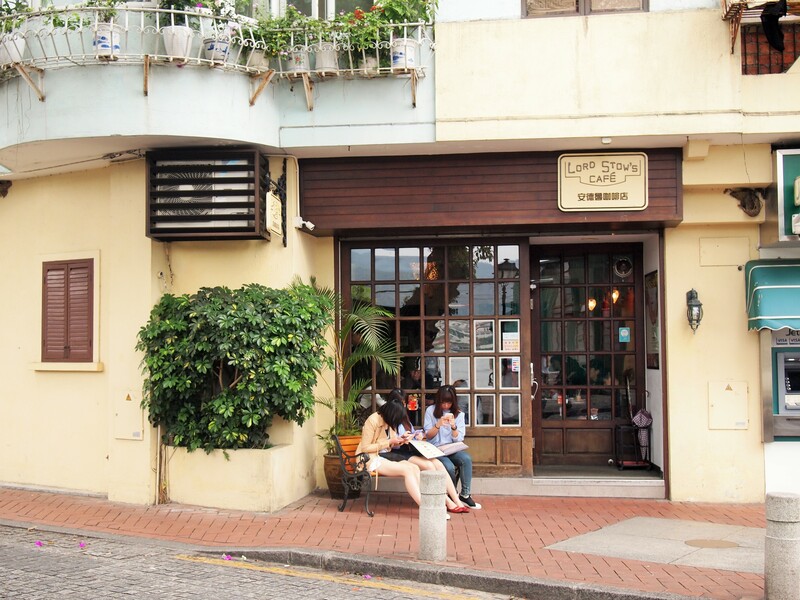 We had lunch at Cafe Cheri, a cute little place we had noticed the day before in Taipa as well. 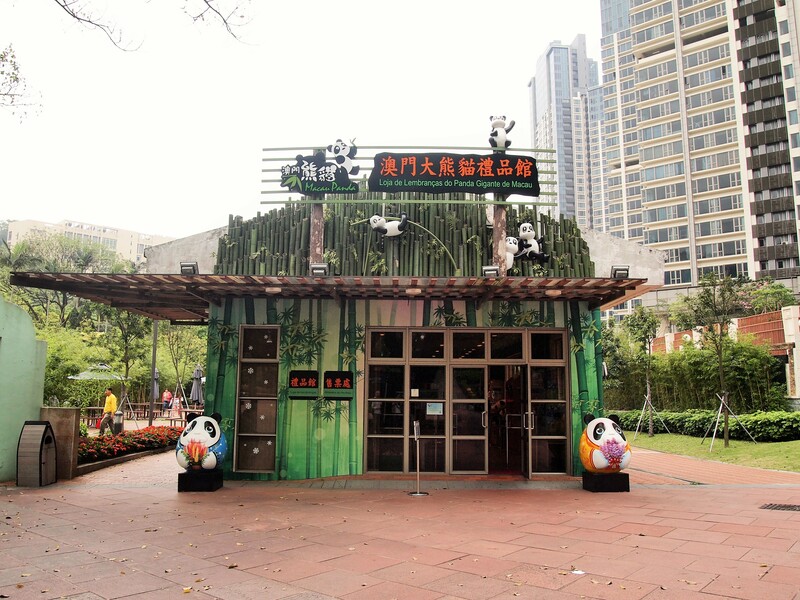 Our lunch was wonderful – Zach had their pork chop bun and I had the pork chop meal with rice and veggies. 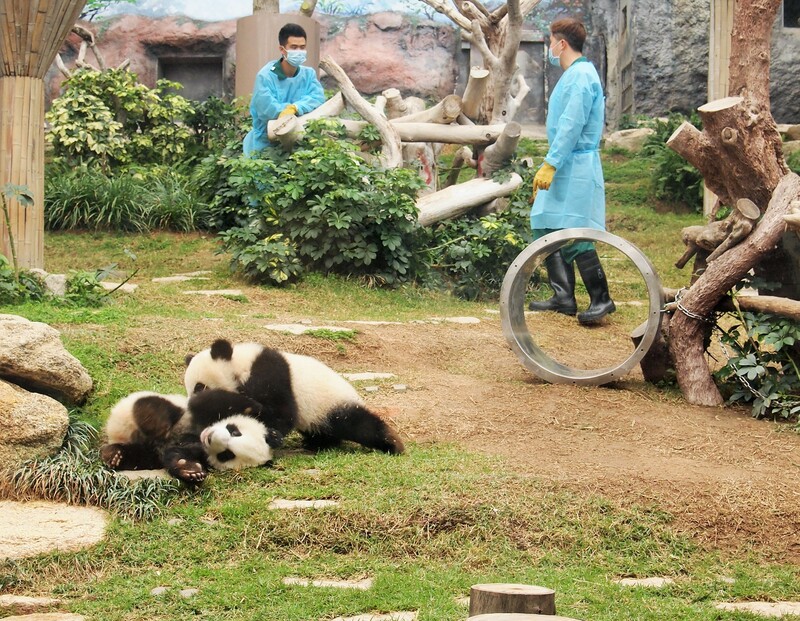 It was just the pick-me up I needed to make another try at seeing pandas. Fed up with the bus, we hopped into a cab to make the brief journey back to Parque de Seac Pai Van. Hindsight is 20-20. 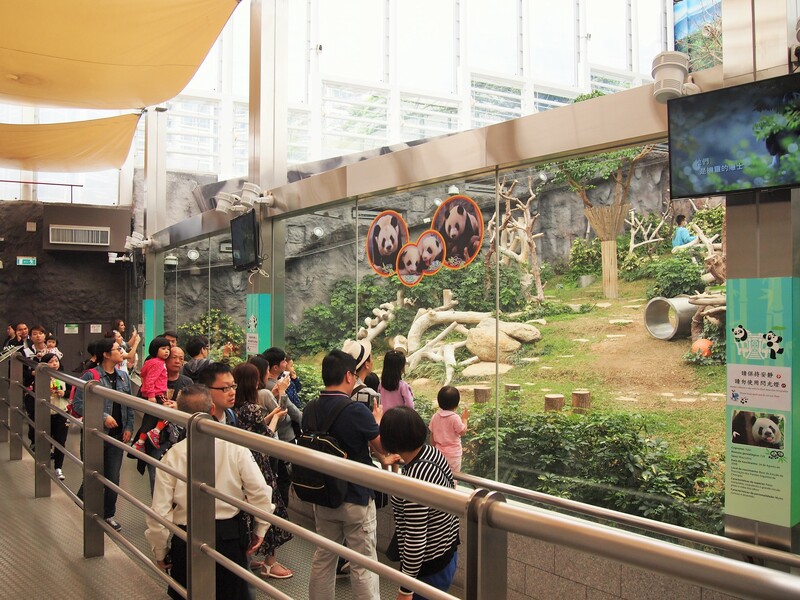 This time we easily made it to the panda pavilion and bought tickets for the next hour’s viewing. 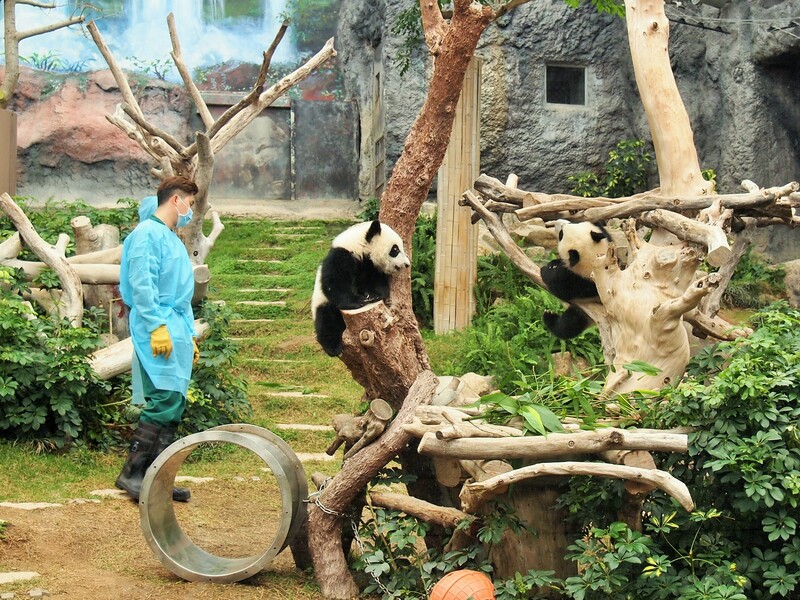 Macau Panda Pavilion is home to four giant pandas – two adults and two cubs. 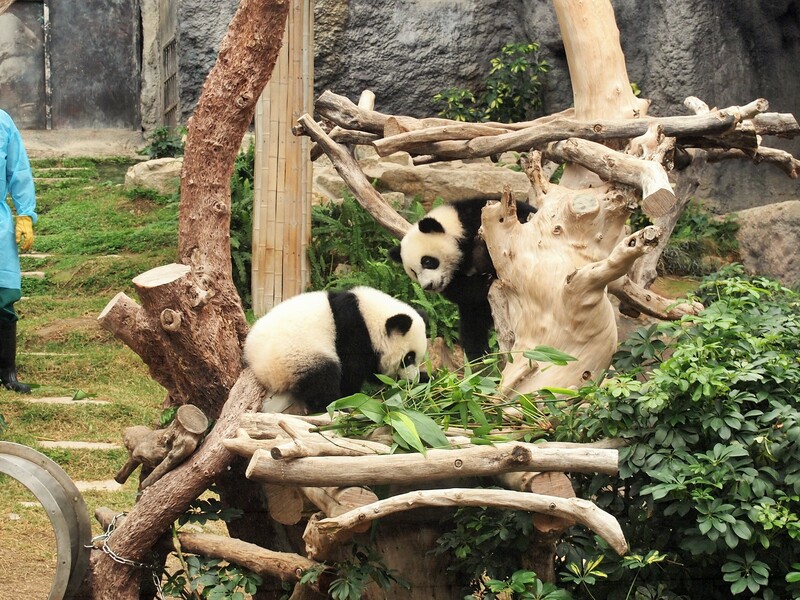 The twin cubs, Jian Jian and Kang Kang, were born in June 2016 and were the first pandas born in Macau. 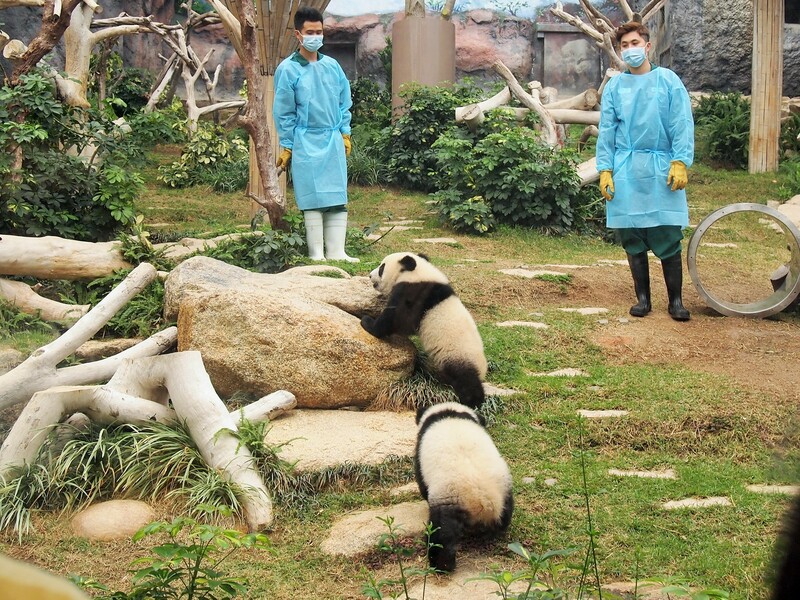 The parents, Xin Xin and Kai Kai, were gifts from the Chinese government on the 15th anniversary of Macau’s return to China. We were able to see both cubs and they were the highlight of our visit. They were so adorable!!! 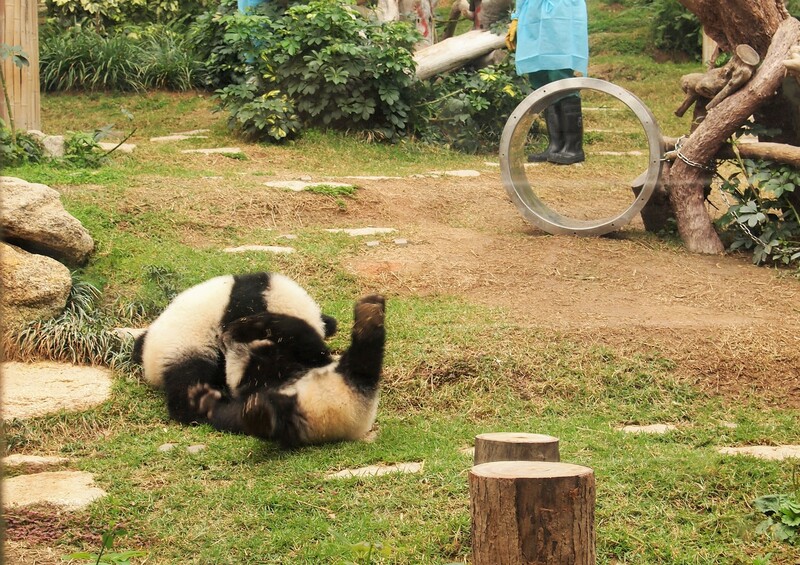 They played, rolled around, chased each other and the handlers, and were just too damn cute for words. It was quite difficult to tear ourselves away from the cubs. We could have watched them for hours. The adult – I’m not sure which one we saw – was much less exciting. 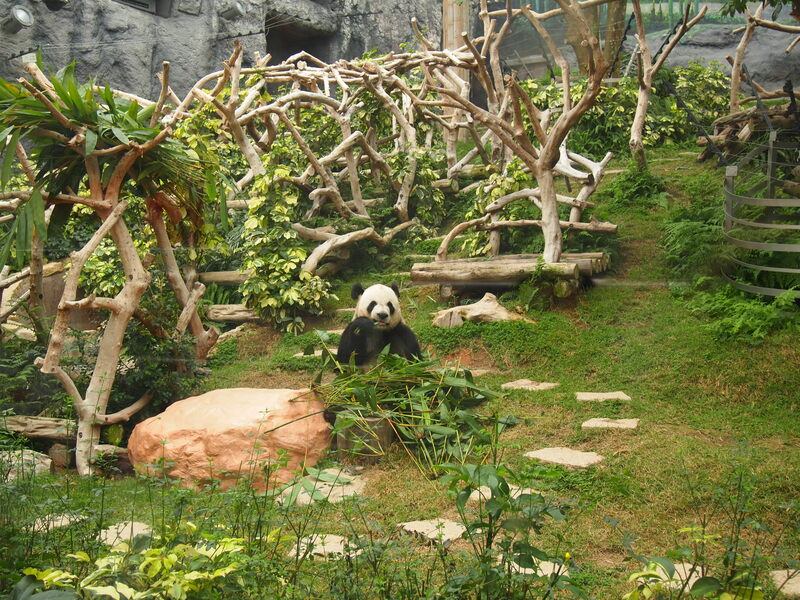 He/she simply sat in the center of the enclosure and munched on bamboo leaves. 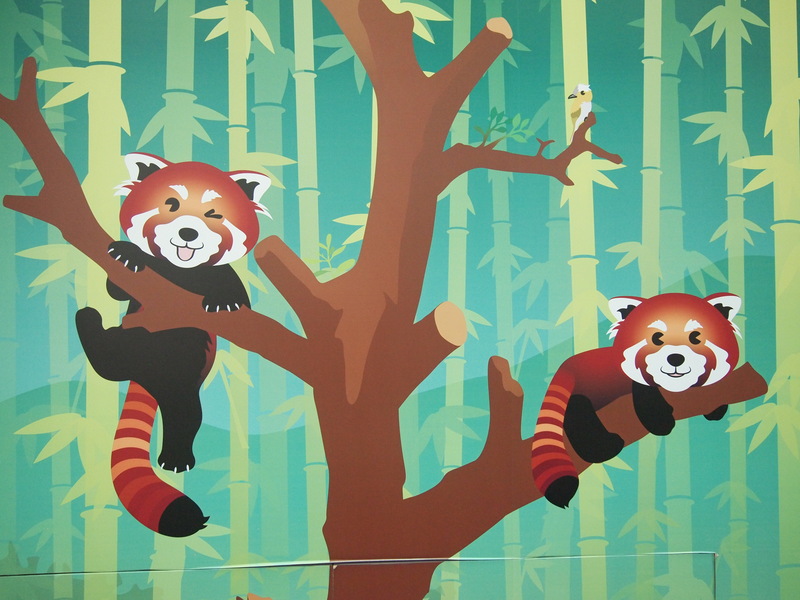 In addition to the giant pandas, the park has some monkeys, swans, ostriches, and red pandas. 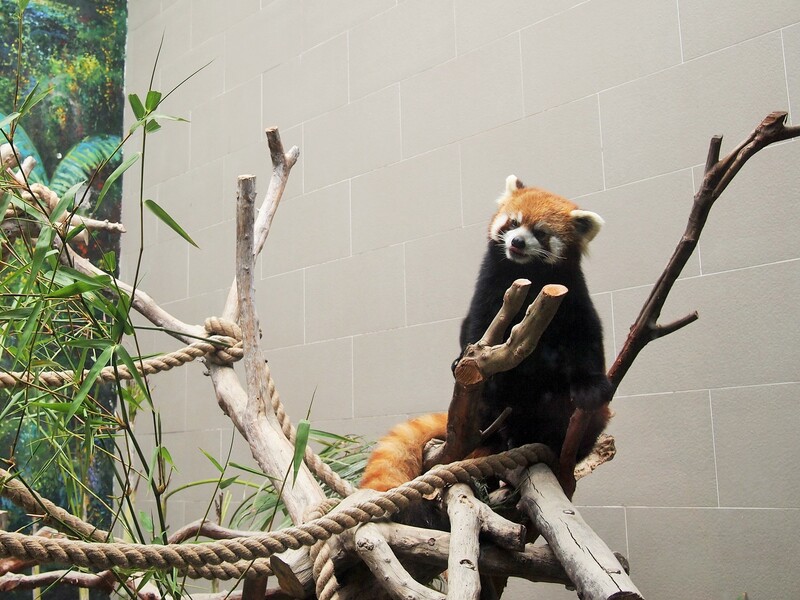 There was only one red panda out when we visited and he would not sit still. 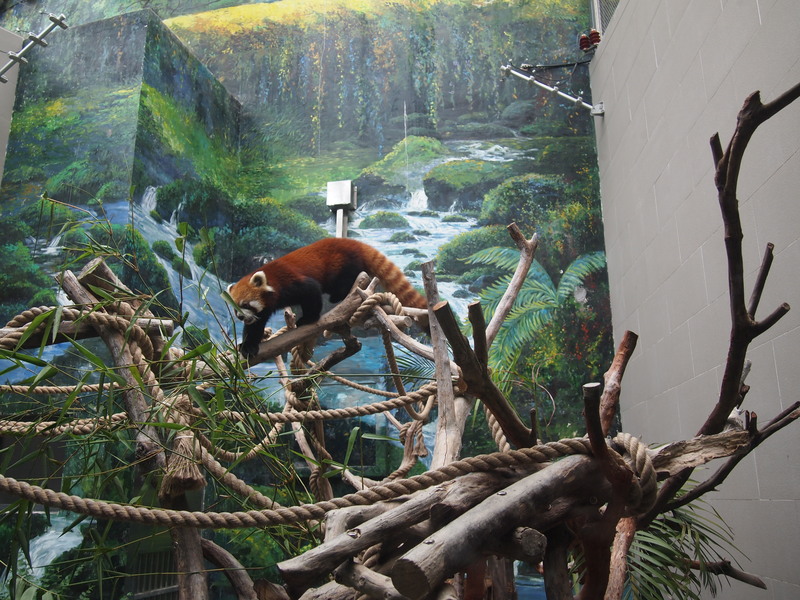 He paced his enclosure the entire time we were there. I attempted to get some photos of him but it was pretty tough. He was still a cutie though. 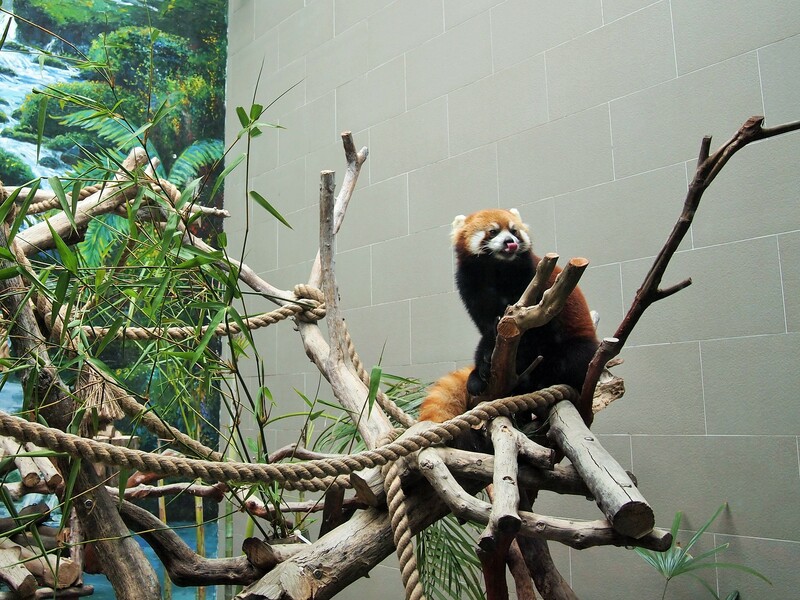 Seeing the giant and red pandas was such a high! It was one of my favorite parts of the entire trip! 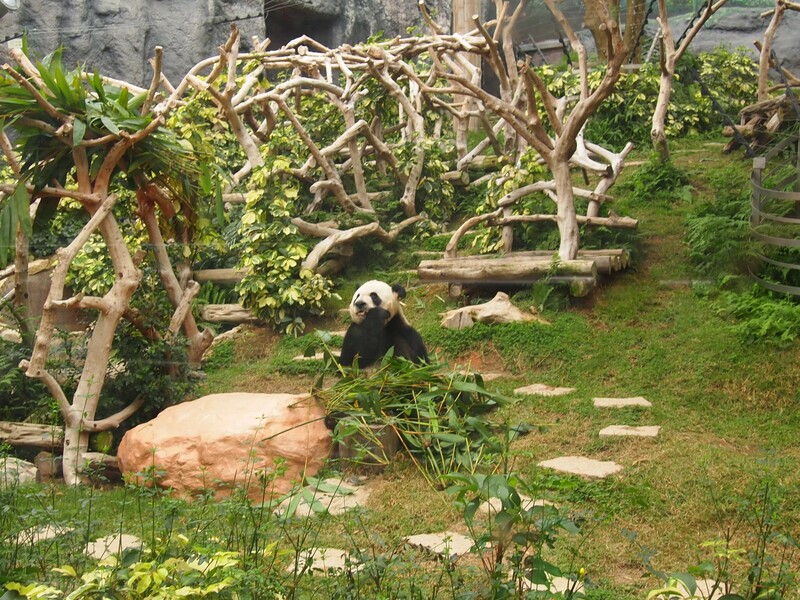 In theory, that should have turned my mood around, but it was late afternoon and after the high of seeing pandas, I was kind of tired and moody. 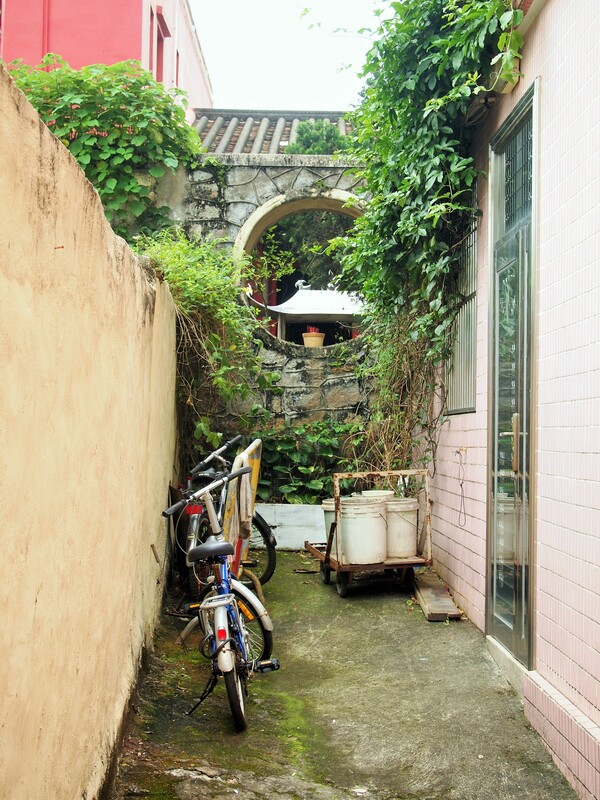 So when we got back on the bus to visit one last spot in Coloane, I wasn’t really in the mindset. 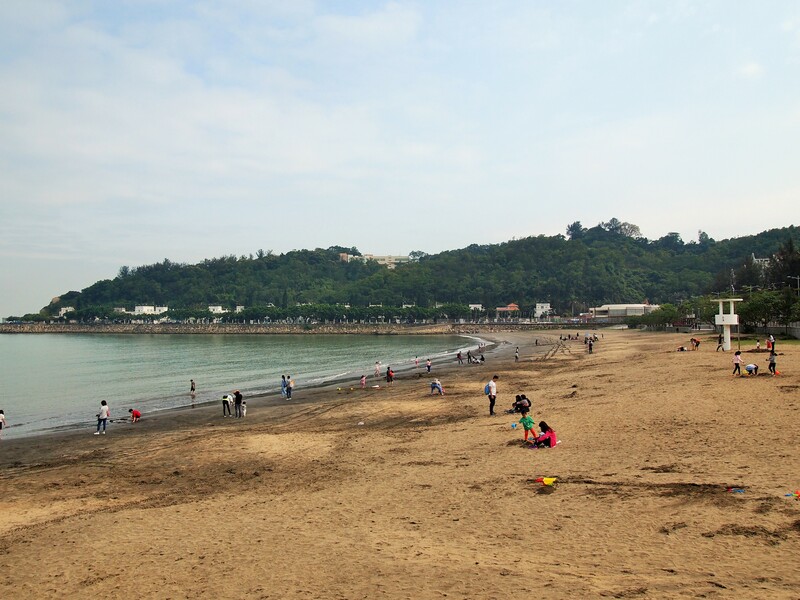 Our final destination in Coloane was Hac Sa Beach, Macau’s prettiest and largest beach. 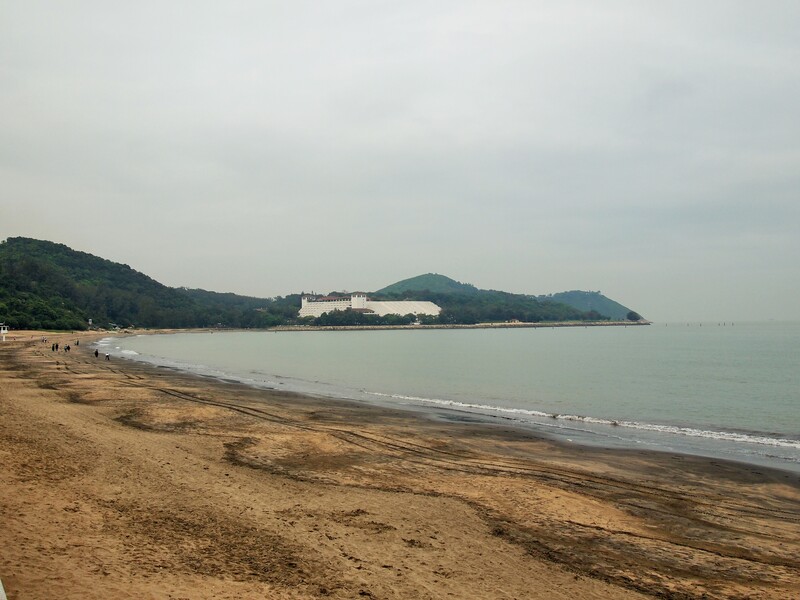 Hac Sa Beach is naturally a black-sand beach but because yellow sand has been used to fill it in, the appearance isn’t very striking. It’s a little off-putting in my opinion. The beach is quite long; there weren’t many people out and most were clumped in one area, so if we had wanted we could have staked out a decent spot on the beach. The sun had just started to come out when we arrived and I had forgotten my sunglasses – strike one – there was no beach-front bar – strike two – and there wasn’t a decent place to sit with a beer in general – strike three. As I said, if I had been in a better mood from the start I would have enjoyed it more because it was truly not that bad. 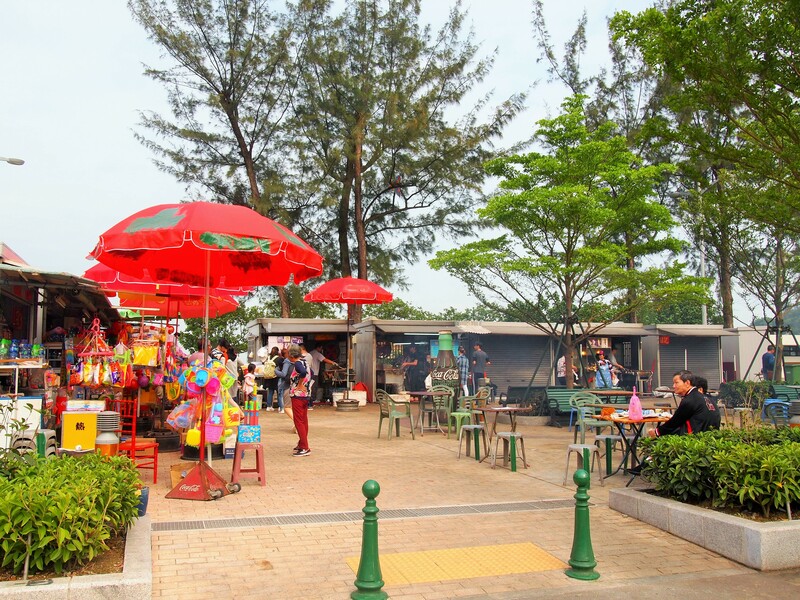 There are beach-side vendors with an assortment of drinks and food that they will grill up for you. Plus there are a couple restaurants, not on the beach, but just across the street where it would still be pleasant to sit. 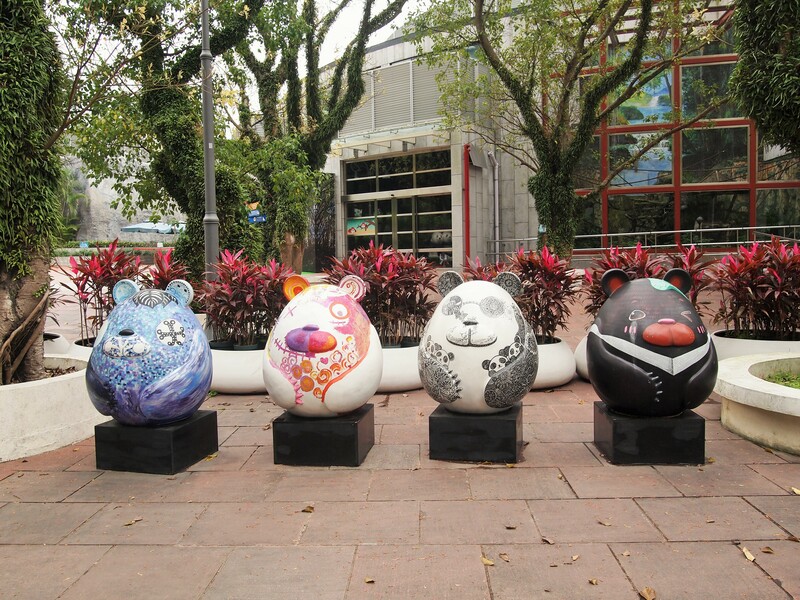 We weren’t hungry and I could not be placated, so we didn’t stay long; we decided to head back to Taipa where we relaxed at Quarter Square instead. 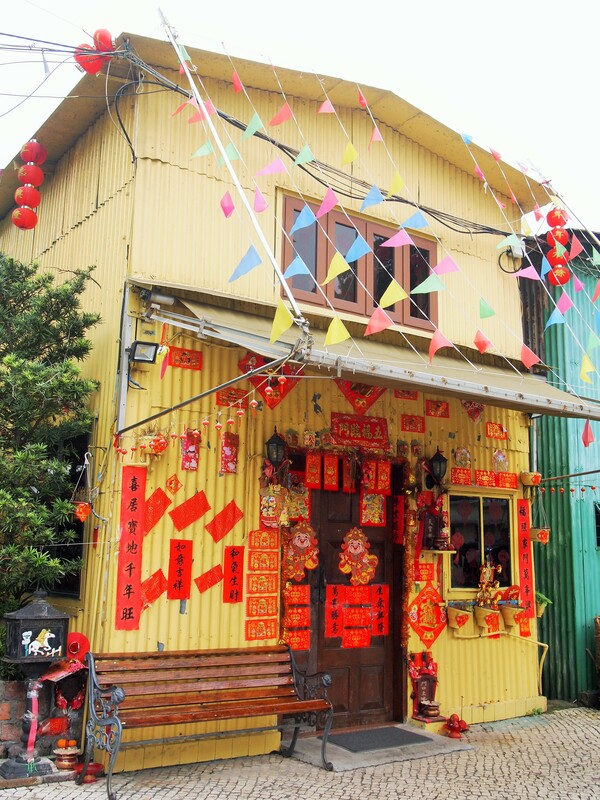 All in all, even with our mistakes in navigating around Coloane, it was a welcome change from the peninsula and even Taipa. 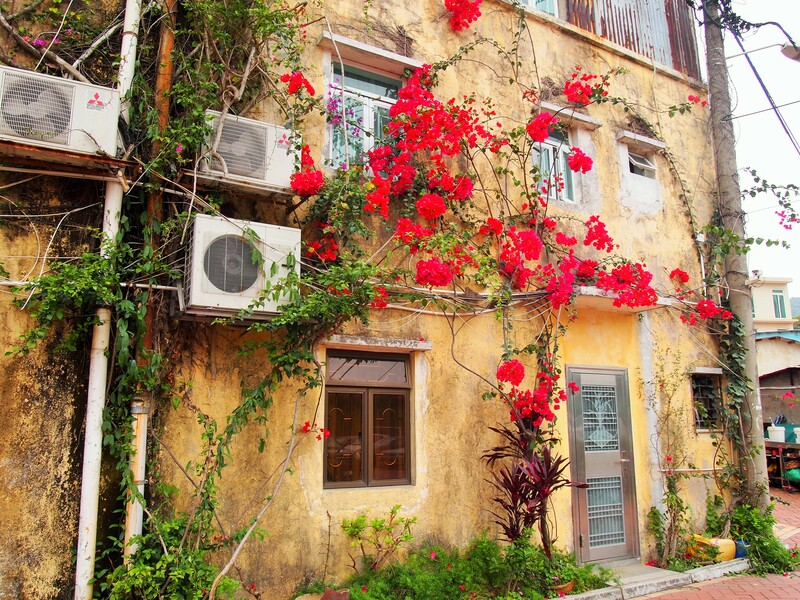 Hopefully all of the changes taking place elsewhere in Macau won’t alter Coloane’s laid back, peaceful vibe.